We frequently hear cited the “observer effect” in research discussions. This is the idea that you cannot observe something without changing it. Why is that? Well, among other reasons, it just takes a discrete amount of time to observe something and turn that observation into usable information. If most folks take about 2/10 of a second to make the simplest of observation-reactions, by the time you have observed it, it has changed. In the case of a human taking one step at a reasonable average speed of about 3 feet/sec then during the 2/10 sec that it takes just to see them moving and realize you’ve seen it, the moving center of mass has moved greater than 7 inches. If the observer is in motion too, the change could be as much as 14 inches in 2/10 of a second. By intelligently synchronizing your motion with that of the opponent, you can cut the chaos and imprecision in the system by as much as half (e.g. from 14 inches to 7 inches in our example above). A 2X increase in precision is a big deal! If you don’t move as he crosses ma-ai then he’ll be greater than 7 inches closer than you thought by the time you see him coming – and that’s just observation-orientation time. It takes much more time to plan a response and get your body into motion. If you see an opening, it’s already too late to attack it because by the time you get there everything will be at least 7 inches different than it was when you made your plan. There’s a famous story (maybe apocryphal) that Joe Lewis retired when he realized he was seeing openings before he hit them because that’s when he knew he was getting too slow. He was still at the top of his game, but it freaked him out too much to realize that he’d never actually seen an opening before – he just hit where the opening was going to be. That’s why you have to learn to predict the opponents’ intentions (reaction patterns). The question is: how you do that? There are considerably exercises out there which explain just the patterns of movement (like do not use big movements or you moved to much to the side etc.) , but this in my opinion will not make you faster. Once you have learned to predict the opponents intention, the next step would be to “speed it up “ to the level where you can execute the technique and at the same time react on those “openings”. Well, I have the exercise which clearly change your mind set when it comes to this “speed it up” thing. You can call it “predictive mind” exercise and I think I’ll write something on that next time on my blog. It's even worse than that, Patrick. 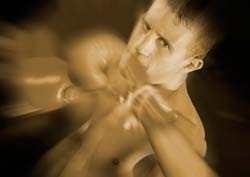 A quick punch moves at around 40 feet per second. There is just no way to respond by using methods that require a 200ms delay. I'll write something more about unconventional methods in my next post. It's even worse than that, Patrick. A quick punch moves at around 40 feet per second. There is just no way to respond by using methods that require a 200ms delay.